Happy flu/cold season! Has it hit your house yet? Fortunately the kids have managed to dodge the flu (please, karma, don’t jinx me here) but we’ve all had a round of yucky colds. And, as I made this recipe for about the 5th time since Christmas, it occurred to me I don’t think I’ve even shared it with you! I realize “best ever” is fairly aggressive, friends. 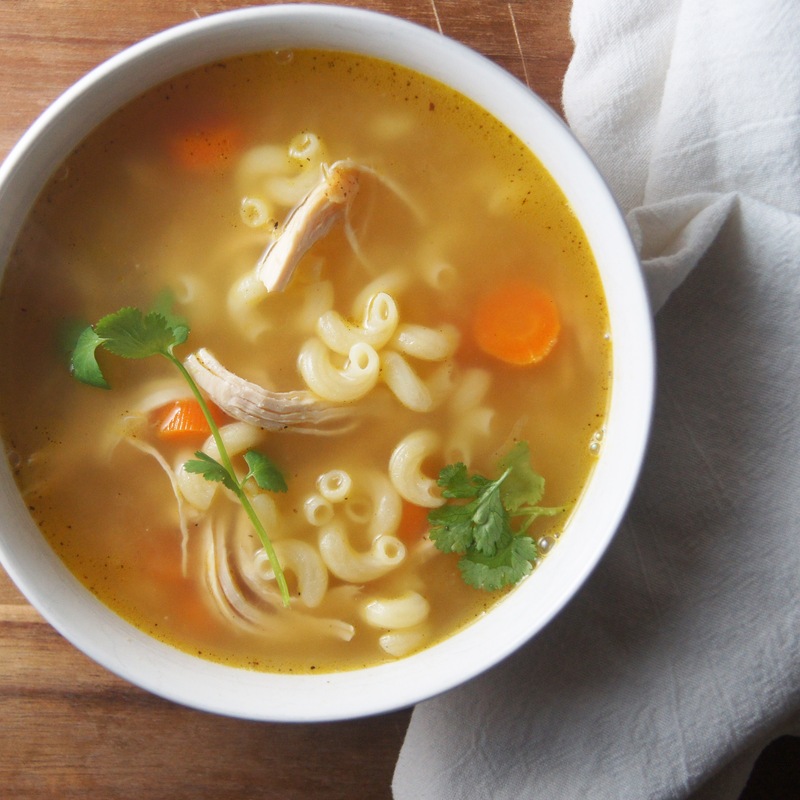 But for as little time and ingredients you need to put into this soup I’m not sure you’ll find an easier recipe that yields this kind of superior comforting, savory flavor. My kids love this…and I wish you could see the baby kicking those chubby feet when he gets to indulge in a piece of crusty bread that’s soppedup all of the broth…it’s a sight for sore eyes! It just has that warm, healing effect. Such a staple! Heat olive oil and butter in a large pot or Dutch oven over medium high heat. Add the chicken and cook for 2-3 minutes, or just until it begins to turn golden. Flip the chicken over and cook for an additional 2-3 minutes. Remove chicken and set aside on a plate. Add onion to the pot and cook, stirring often, for 1 minute. Add the chicken stock, water and bay leaves and bring to a boil. Return the chicken to the pot, turn heat to medium, cover the pot partially and simmer for 20 minutes or until chicken is cooked through. Remove the chicken and place on a plate. Shred with two forks. Remove the onion pieces and discard. Add the carrots and shredded chicken/juices to the pot and simmer for 5 minutes. Remove bay leaves and season the soup, to taste, with plenty of salt and pepper.